Wes Anderson is back with a brand new movie, his second animation film, called Isle of Dogs. You can definitely tell that this is a Wes Anderson film. In a futuristic Japan, a crooked mayor exiles all dogs to a garbage island to protect the humans from the deadly Dog Flu, despite there being a potential cure being found by his political adversary. However, the mayor’s ward, Atari, hijacks a plane and heads to the Isle of Dogs in search of his personal dog, Spots. Crashing the plane on the isle, a pack of Alpha Dogs find him and choose to help him try and find his dog. Atari is not actually the main character. That would go to the Alpha Dog, Chief (voiced by Bryan Cranston). Chief is the lone voice of opposition to helping the boy, trying to get the rest of the group to follow him away. He is always getting outvoted, so he has to go along with them. Let’s start with the positives, because I think there are plenty of those. The animation is wonderful and feels original. It is unlike most anything I have seen and I did enjoy looking at it. Another positive is the great voice cast. Bryan Cranston, Edward Norton, Scarlet Johansson, Frances McDormand, Bill Murray, Jeff Goldblum, Greta Gerwig, Harvey Keitel, F. Murray Abraham, Yoko Ono, Tilda Swinton, Ken Watanabe, Courtney B. Vance, Liev Schreiber, and Bob Balaban are included. Many of these actors are regulars in Wes Anderson’s films and have a comfort level with the material. The story felt simplistic, yet needlessly complex both. The villainous mayor and his political plans never really make sense, outside of the fact that he and his years of ancestors were cat people. There is a political agenda in this movie and it is not that hard to see what Anderson is implying about the mayor and his manipulation of the public. I also have a bit of a question on why this is set in Japan in the first place. With the dangers of making an analogy between what is happening to the dogs and what has happened to other races being taken to interment camps, I am not sure Japan was the wisest choice. I believe Anderson meant to infuse the Japanese culture into the story, which he did, but I am not sure that it truly aided the movie or is worth the potential trouble. Plus, an argument could be made that there is the “white savior” in this story, thanks to the young girl character Tracy Walker (Greta Gerwig) who stands up to the mayor and helps save the day. Another issue is that the film does not always translate the Japanese language for the audience. They pick and choose when they translate and, since that is what Atari speaks, the film is in danger of isolating one of the main characters from the audience and thus not giving the crowd a real reason to cheer for the boy. The dogs speak English, however, and I felt considerably more connected to them than I did the boy. 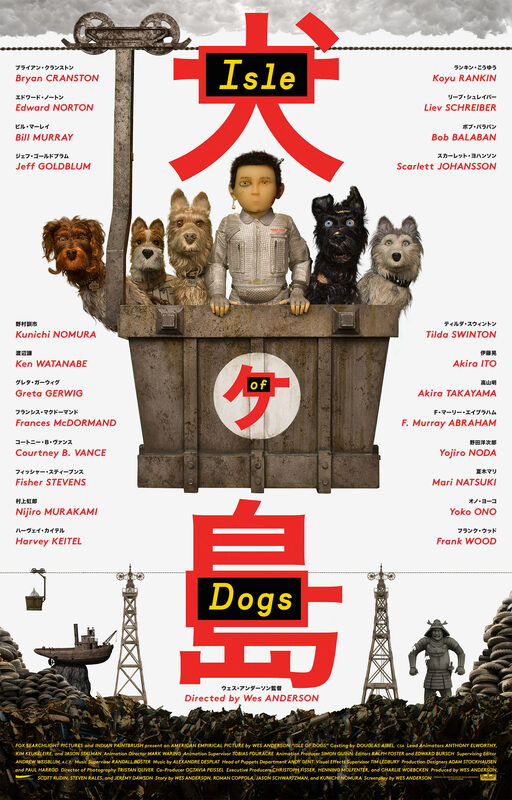 Isle of Dogs is a good movie that has some great touches to it, especially if you love the Wes Anderson eccentric films of the past. However, there are some distinct questions in choices made by the director that might have limited the reach of the film. Still, I liked more than I disliked.